It’s spring so that that means marshmallow Peeps are in stores. Use them to make a fun edible ballerina treat as a party favor or topper for your favorite cake or cupcakes. If you walk into any retail store this spring, you are bound to see marshmallow Peeps bunnies and chicks in every color of the rainbow. People usually have a specific reaction to Peeps. They either love them or hate them. But these Peeps, dressed up as little ballerinas, are sure to put a smile on even the biggest hater’s face. You’ll need some Peeps bunnies and a lot of candies that you may already have around the house. Candy corn attached with melted white chocolate or vanilla candy wafers makes the “tutu.” More candy melt, pearl sugar balls, candy coated sunflower seeds and other assorted sprinkles are used for the rest of the detail. 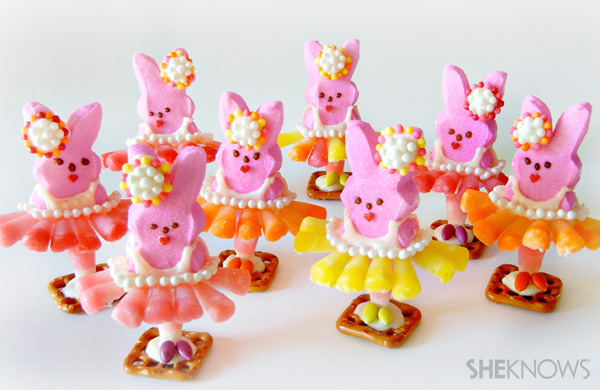 To let the ballerinas stand, attach them to a square pretzel base with more melted candy. Don’t forget a cute little hair piece and little heart mouth to finish them up. Once the melted candy hardens, the ballerinas can stand at attention ready for their next performance. Perfect for a ballerina party or as a cute party favor. Cut each candy corn into halves. Melt white chocolate/candy wafers in a zip-closed bag. Snip an end of bag and “pipe” the top of a ballerina tutu onto each Peeps bunny. Add pearl sugar ball sprinkles as part of the tutu skirt (you can really use your imagination and use what ever sprinkle decorations you prefer). Cut off part of the bottom of a Peeps bunny and attach 1 full candy corn with melted candy as the “legs” and let harden. 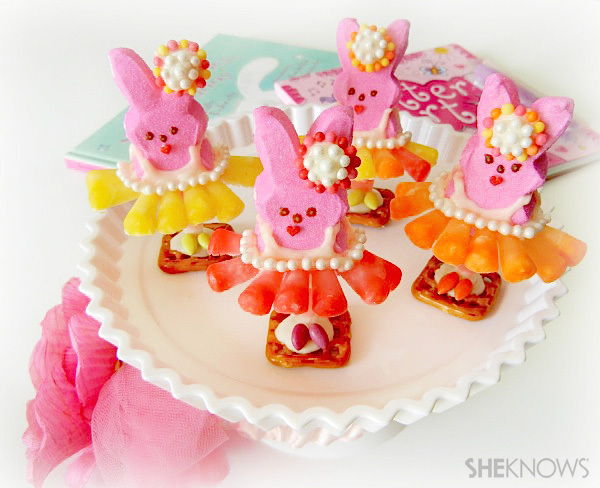 Attach the ballerina to the square pretzel with more melted candy (you may need to hold until candy hardens or lean it against something until set). Add a small heart sprinkle as the mouth. Add a hair decoration (more melted candy with small colorful sprinkles and pearl sugar balls).